We’re delighted to announce Halsway’s first ballad weekend, in which a team led by Pete Coe will explore the performance, sourcing and history of storytelling songs from the last four centuries. Pete, whose pedigree as a performer in the folk scene has few equals, will be joined by leading performer of traditional ballads Brian Peters, and BBC Folk Singer of the Year nominee Emily Portman. The course will offer a wide range of workshops, both participatory and educative. We’ll explore the Child ballads, which include some of the most demanding and rewarding material for the performer in the entire folksong canon, and also some of the ‘big songs’ that F. J. Child missed. We’ll also look at the wealth of texts from the broadside trade, once looked down on by collectors and archivists, but more recently shown to have been essential in the development of balladry. For singers we’ll be offering classes on performance: how to approach the songs to best get the story across – including phrasing, diction, expression, etc. – and how to make the most of the melodies. 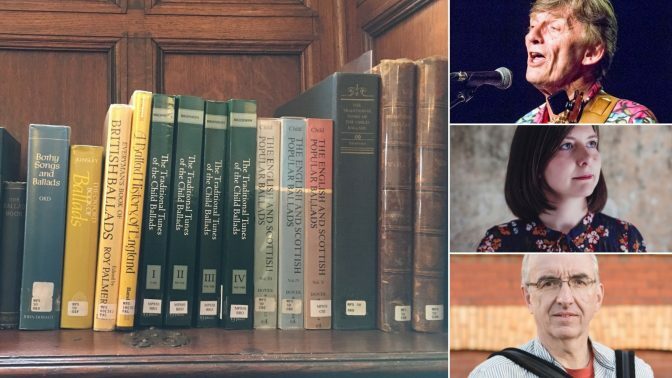 We’ll also be offering advice on searching out new material in books and on the internet; on choosing and using texts and tunes to develop your own interpretations and versions, and on presenting ballads in performance. For those who play an instrument there will be classes in preparing accompaniments that serve the song. There will be plenty of opportunities to sing, both in the classes and in Halsway’s popular evening bar sessions, to which we hope you’ll be bringing ballads of your own. For those wanting to find out more about the background to the ballads and their collectors, we’ll have sessions describing Professor Child’s work, and the heyday of the broadside printers like Catnach and Harkness. We’ll also be listening to classic archive recordings to see what can be learned from some of the great traditional singers of the past. The weekend is aimed at singers and singer / instrumentalists with an interest in ballads – by which we mean songs with a substantive story to tell, including pieces from the classic collection of F. J. Child, the broadside industry, and the wider folk tradition. Singers of all levels of experience, unaccompanied or otherwise, are welcome; for musicians we will be working on song accompaniments on a variety of instruments (our tutors cover melodeon, concertina, guitar, banjo, bouzouki, dulcimer, etc) rather than teaching basic technique, so a good degree of competence will be necessary. We’ll publish a programme soon showing workshop options to give you a clearer idea of what to expect. Pete Coe is a singer, multi-instrumentalist and song collector, and has been a professional touring and recording folk musician since 1971. He’s played in iconic bands including The New Victory Band and Bandoggs, but he’s best known for the variety of his solo performances. Pete has also researched and given illustrated presentations on broadside ballads. Brian Peters is an experienced singer of traditional songs with a wide repertoire but a particularly strong reputation as an interpreter of the ‘Child Ballads’. He’s a multi-instrumental accompanist proficient on guitar, anglo-concertina and melodeon, has given classes on ballad repertoire and interpretation in the UK, USA and Canada, and devised the ‘Songs of Trial and Triumph’ presentation and CD, devoted to the Child Ballads. Emily Portman (Furrow Collective, and Emily Portman Trio) is folk singer, writer and concertina player with nominations for folk singer of the year and holder of the 2013 BBC Radio 2 folk album of the year. As well as being a performer and lecturer at Newcastle University, Emily has presented BBC Radio Merseyside’s folk show ‘Folkscene’, written articles for the acclaimed roots and world music magazine fROOTS and has given talks on ballads at Cecil Sharp House and The International Ballad Conference. “her album Coracle is, without doubt, one of the folk albums of the year” Songlines. “Dark, dark is the considerable beauty of Emily Portman’s work” fROOTS.